The greater our success in terms of porting and increasing compression ratio and engine RPM, the harder it becomes to effectivly lightoff the compressed charge. Fortunately, improving the ignition is not a great challenge these days and, for the most part, not that costly either. But the situation has not always been so. Until the 1970s, the contact breaker (or, as they were often called, points) system dominated. In such a system, the spark was triggered when the contacts were opened by the cam in the distributor. This system was prone to many mechanical and electrical problems. From the mechanical aspect, the points were prone to bouncing near the top end of even a stock engine’s RPM range. They also needed continual adjusting to maintain the correct gap. This was important; it controlled not only the coil charging time but also just how cleanly the points seperated on opening. 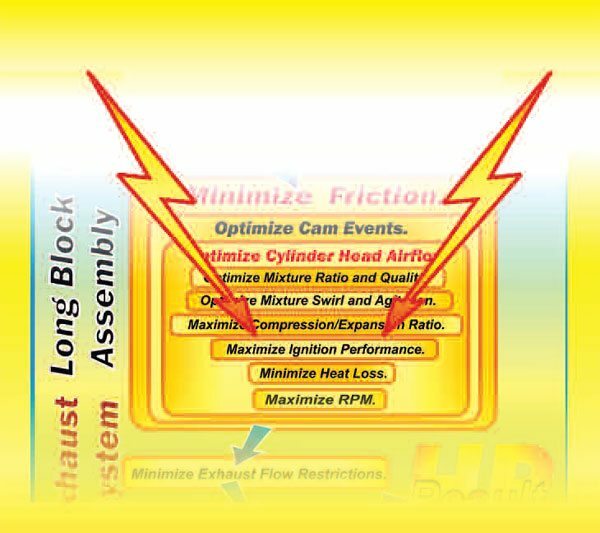 These factors affected spark intensity and RPM capability. Also the contact breaker faces would electrically erode, which in turn prevented a sharp break at the moment of opening. This cut spark capability. In all, the contact breaker system was a small performance nightmare. 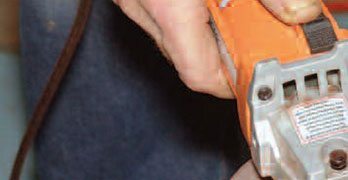 There are many myths surrounding ignition systems and what is needed for best results. In this chapter we cut to the simple truths of what is needed for a functional system. Back then (1967 or so), when I was racing a 9,000-rpm 1-liter Mini Cooper, a change of points and a very careful setup was done prior to every race. Not only that; we used selected points with the strongest spring we could find. That often meant going through as many as 10 sets to find a set we would actually use. With the right cam profile and a set of strong-spring contacts, we could get as many as 10,000 rpm from our 1-liter engine and still have it fire just fine. If you are restoring an early performance car, you may want to stick with the contact-style distributor. 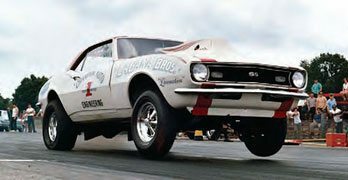 And the good news is that current aftermarket contact-style distributors incorporate just about all the go-fast moves that were ever done back when. You still need to adjust or replace the contacts regularly, but other than that, they do perform. For our race program in the 1960s, all the fuss and bother with contact breaker ignitions was more than we needed. At that time (about 1963), I was an apprentice in the aircraft industry and studying for my engineering degree. I had access to many cutting-edge electronic components because the laboratory I worked in dealt mostly with advanced electronics for the aviation industry. One of my bosses (an incredibly smart mathematician listed as one of the top 10 in the world), suggested I make a transistor circuit to handle the switching on and off of the coil with a big-power transistor and leave the points to handle the very low current and voltage necessary to trigger the transistor in the first place. I designed a simple circuit to do just that. It worked because reliance on the contact breaker to produce a strong spark was virtually eliminated. The system could run with a very small contact breaker gap setting, and this increased the RPM capability substantially. I ran a spin test in a lathe to about 5,500 rpm (equivalent to 11,000 engine rpm) and still no sign of contact breaker bounce. Finding a points-style (contact breaker) distributor in my arsenal of speed parts proved fruitless but MSD’s Todd Ryden saved the day. The arrow indicates the points. This early kind of transistorized ignition was known as a TAC (transistor assisted contacts) system. Soon after building this system, I found I was far from the first to do so. Indeed, some electronic whiz kids were already building systems that relied on something other than a set of mechanical springs and contacts to trigger the collapse of the coil’s magnetic field that subsequently generates the high voltage for spark production. The common use of the contact breaker system was destined to come to an end. The only surprise here was the time it took the auto industry at large to do so, and for the electronic system to become universal (early to mid 1980s). But all that was back when. These days, ignition can plague us, but the fixes are often as easy as replacing a cheap part. Generating a big fat hightemperature spark at the spark plug, at the appropriate moment, is the number-one objective here. 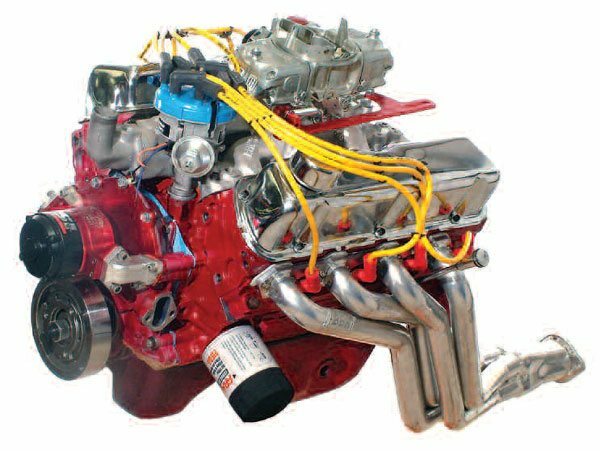 As hot rodders, we may have been less than enthusiastic about cars having to meet power-robbing emission standards, but the reality here is that it forced manufacturers to drastically improve the ignition system’s performance, and that was good for us all. Modern systems are generally good to excellent, but that does not mean they cannot be improved upon. Starting at the spark plug, let’s see what we need to do to maximize performance. 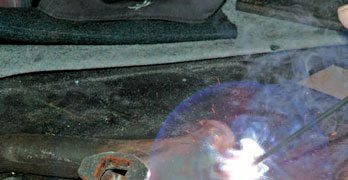 The first step toward making sure your ignition system is up to the job for your engine is to establish that the plug is in the right heat range. 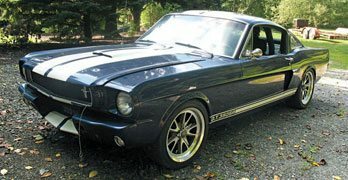 To do this, run the engine hard under full load for about 30 seconds, then shut the throttle down, and cut the ignition. Pull the plugs and primarily check the center electrode and the insulator core around it. If it shows any sign of blistering or overheating, a cooler-running plug is needed. Remember, if the plug gets too hot, it brings the onset of detonation and the likely destruction of pistons. 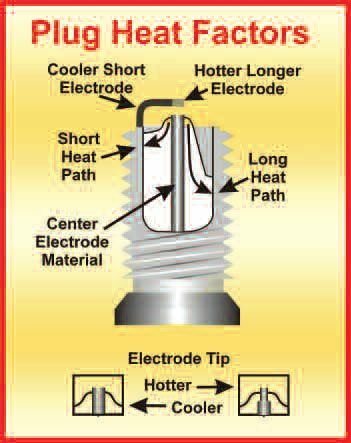 Illustration 8-1 shows how a cooler-running plug differs from a hotter one. It is better to run with a plug that is a little too cool rather than one a little too hot. If the plug is way too cool, if there is a possibility of it fouling up; it is not reaching a high-enough temperature to burn off deposits. Assuming the plug temperature rating is on the mark, the next issue to deal with is the plug gap and the form of the electrode. A very important issue to appreciate here is that ignition performance is a function of spark temperature and energy input. If the plug gap is very small, it takes minimal voltage to fire it and the energy involved is consequently low. From this, it follows that a bigger gap discharges a spark at a higher energy level, and that is exactly so. But a big gap uses coil output and, to an equal extent, causes a drop in the RPM to which the system can run before misfiring. 8-1. 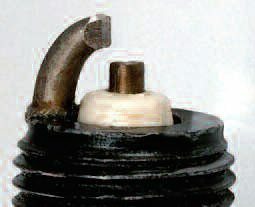 The spark plug should run at a temperature that ensures deposit burn-off, and no more. Here are the factors that affect it. 8-2. The longer the side electrode, the easier it can overheat. Also sparks propagate from edges easier than flat surfaces, hence the form of the modified shape. A general rule here is that you should run as large a plug gap as possible, consistent with the engine’s peak RPM. Another factor here is that the bigger the plug gap, the more difficult it becomes for the plug cables to do their job before breaking down and firing sparks at random due to the higher resistance that the wide plug gap presents. Big plug gaps then require plug cables with a higher/better insulation value. 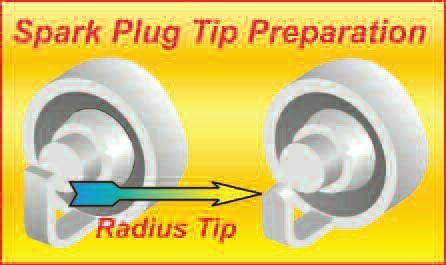 The next issue to address, as far as plugs are concerned, is the tip form. Over the years, I have experimented with various designs, some of which have shown real promise. However, there is not space here to go into some of the complex designs and what they present in terms of performance advantages. You would have to make the tips in your own shop, and that is beyond the scope of this book. Instead, let’s look at a simple form that is about 99-percent effective compared to the best I have managed to date. Illustration 8-2 shows the electrode is both rounded off and shortened so it is only about a third of the way over the center electrode. This and the biggest gap possible (with good plug wires this can be as much as 0.055 inch) gets the job done performance-wise but erodes faster than a more conventional plug tip. This means changing plugs more often to maintain the spark quality. For what it’s worth, I install new plugs in a racer about every event. Here is an Autolite plug I prepped for one of my engines. Follow this form, and you won’t go wrong. so often see ignition problems that are fixable just by replacing the plug cables. Depending on the quality of the plug cable, the insulation breaks down with time and heat. If the cables don’t look good, the chances are they are not. Cracked or burned insulation just does not work. Assuming they are not cracked or burned, the best way to determine if your cables are up to scratch is to check their resistance. For this, you need just a cheap multimeter. The commonly held belief—the lower the plug wire resistance, the better—is not quite true. Although counter-intuitive to the obvious, the cable needs some resistance. 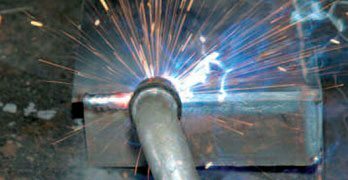 If, say, a plain copper wire is used with virtually zero resistance, it causes the spark to extinguish quicker, thus producing a less-effective spark. It seems that the best plug cable resistance lies between 100 and 1,000 ohms, so the margin here is wide enough to easily achieve. Just because plug leads look new, does not mean they are functioning okay. Burning at the plug boots can be a big problem. It is not necessary to spend a fortune on plug cables. On most of my budget-constrained engine builds, I use these Accel carbon-string plug cables. They don’t cost much, work fine, and are good for about two years of street/strip use. These results show what a simple thing like old plug cables can do to output. The black curves are for the old plug cables and the red are for the new ones. Here we are looking at an average of 6 ft-lbs of torque and, at the top end, an almost 7-hp increase just by swapping old plug cables for new. 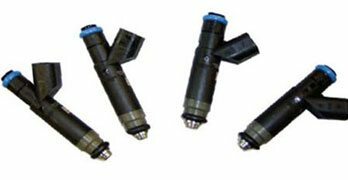 The same applies to other items in the ignition system, such as spark plugs, rotor caps, and rotors. 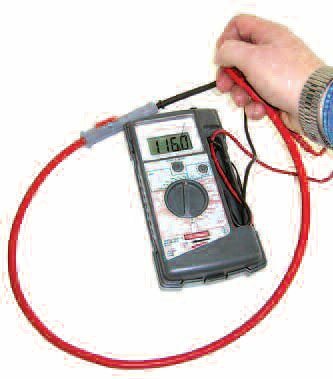 A decent multimeter such as this can be had from your local parts store for as little as $20. It establishes the resistances of the plug cables. If you have the budget, this spiral-wound wire-type plug cable is what you should be using. 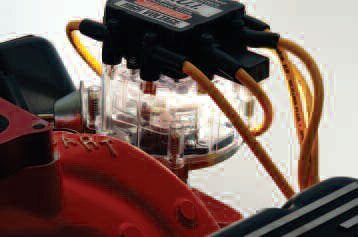 The distributor cap discharge points and the rotor are subject to spark erosion. Install new parts when any significant erosion is seen. This ZO6 Corvette engine has one coil per cylinder. Although appearing well equipped in terms of coil capacity, the system is designed to work optimally within the stock-RPM range. In real life, plug cables can have a resistance far higher than we are talking about here. Typical carbon-string cables can be as much as 3,000 ohms per foot. While this is not exactly what we want, such a cable does do an effective job of eradicating RF radiation that otherwise interferes with your radio. Unless you are pushing for the ultimate no-matter-what, do not fixate on having the lowest-resistance wires there are. Just put in the best you can afford and locate the plug caps as far from (or protected from) a cable-killing heat source as possible. If you can afford better plug cables, then there is often a small output advantage to using spiralwound-core plug leads. 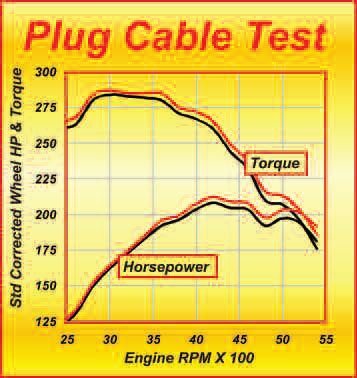 Tests I ran some years ago on a hopped-up distributor machine indicated that dropping the total resistance in the entire length of the plug cable below about 1,500 ohms showed no measurable increase in the RPM to misfire. Looking at the industry’s high-performance offerings indicates they mostly fall between the 45 to 300 ohms per foot range. This means any high-quality plug cable set meets the 100- to 1,500-ohm limits that are required. Next thing on the list here is: If your engine has a distributor, then make sure the cap and rotor are up to scratch. Spark erosion here can bring about a significant drop in spark quality. Also while you are checking/replacing the rotor, check the distributor shaft for side play. 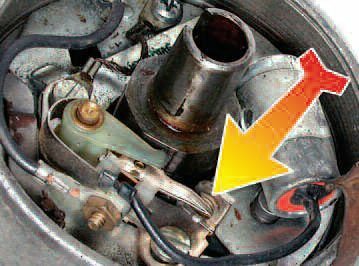 Anything detectable warrants fixing— shaft wobble causes ignition timing scatter, and on many engine types this causes a very real drop in output. 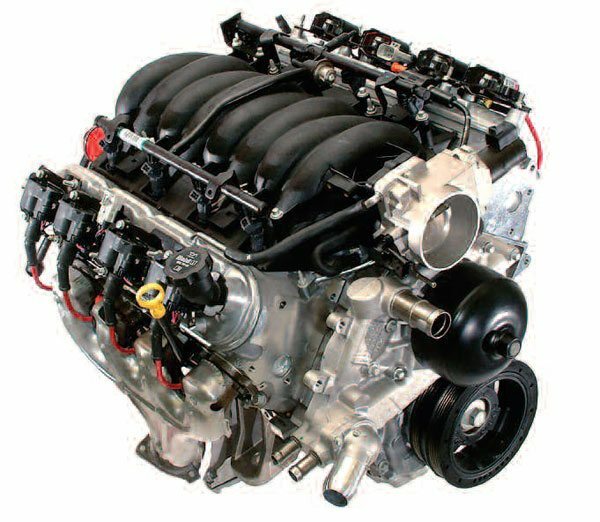 With a 13.5:1 compression and 8,000- rpm capability, this Chevy LS6 engine called for a serious upgrade in ignition capability. The bottom line here is that the first step toward improving the spark capability of your performance machine’s ignition is to make sure all the consumable components are up to scratch. If the stock components are operating properly but are not providing strong enough performance, you need to consider the aftermarket ignition options for improvements due to the needs of, say, the higher RPM, bigger plug gaps, higher compression, boost, or whatever. So let’s take a look at what you can do here. I am starting our system hop-up with coils, but let me first say that ultimately a coil’s performance is related not only to its ampere-turns ratio, but also to the manner in which the coil’s voltage is chopped at the moment the spark is required. That said, we have to start somewhere, so let’s make it the coil and its performance. First, no matter how fancy the setup may look, factory coils are designed to provide sufficient spark for a stock engine, and many factory coils are not immune from deficiencies when it comes to increased RPM. So why do the OE coils not stack up here? Simple: The more output a coil has, the more current it uses, and the more expensive it is likely to be. Neither factor endears itself to an auto manufacturer trying to keep overall costs to a minimum. So while factory coils may be more than acceptable for a stock situation, those high-performance mods you are contemplating can cause your engine to outpace the stock coil’s performance. 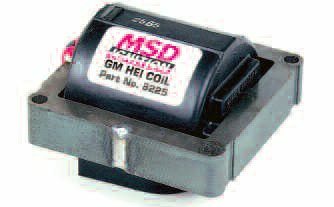 When used in an HEI distributor, this MSD coil was good for a 500-rpm increase before spark dropping occurred. Three factors enhance a coils capability: a greater turns ratio between the primary and secondary winding; a superior iron-alloy core; and a faster means of chopping and restarting the voltage/current fed to it. The first two factors involve coil design. By manipulating these, a coil with a greater capability can be produced, but in most cases you can expect the coil to use more current and/or cost more. Most aftermarket coils from reputable suppliers are worth about 500 to 1,000 rpm more than stock coils. The third factor—how we switch the coil on and off—matters greatly as far as RPM is concerned. We need to charge the coil’s magnetic field as fast and as long as possible between firing, to maximize stored energy. When the spark is required, we need to cut the voltage to the coil as rapidly as possible to maximize the rate of collapse of the magnetic field. All this used to be done by the contact breaker points but, with the advent of electronic ignitions, it is all done with transistors and the like. Essentially, the electronics supplies voltage to the coil’s primary winding and then chops it at the appropriate moment. 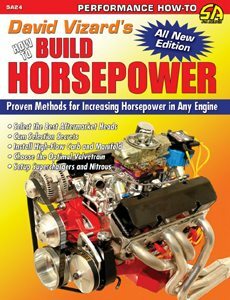 The key question here is: Can the electronics (an ignition box or the electronics associated with the stock computer) supply the requisite voltage up to and past the RPM capability of the engine? If there is doubt, you need to start checking to see which automotive electronics company has the required components to upgrade your system. Having a strong spark is only half the battle. We also we need to be sure the ignition timing is optimally set. 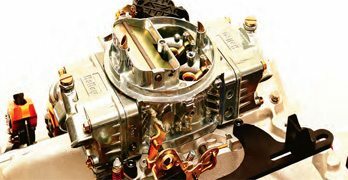 So what is the optimal ignition timing? It varies and primarily depends on RPM and manifold vacuum, which, in turn, varies depending on the throttle opening. There are other factors involved such as fuel type, temperature, compression ratio, etc., but let’s focus on RPM and vacuum. My own tests show that MSD’s highperformance electronic module and coil kit for the GM HEI distributor has an 11,000-rpm capability! The RPM-induced advance, often referred to as mechanical advance, is tailored to suit the engine’s requirements by spring selection (yellow arrows) and the shape and mass of weights (white arrows). At low RPM, there is significantly less mixture motion than required to speed up the progression of the burn after it has been initiated by the spark. Indeed, at low RPM, the burn of the fuel mixture progresses relatively slowly. But because the engine is turning slowly, there is more time for the burn to progress. To get the best output from a cylinder’s charge, the combustion pressure needs to peak somewhere close to 15 degrees after TDC on the power stroke. At, say, 1,000 rpm, the best torque may be seen with the timing at, say, 14- degrees BTDC. But at 2,000 rpm, the timing need not start proportionally earlier. More advance will be needed but, at 2,000 rpm, the influence of mixture motion is starting to come into play. This has the effect of speeding up the burn, so something less than a proportional increase in timing is needed. By the time a typical two-valve engine reaches 3,500 to 4,000 rpm, the increased charge motion/ turbulence is speeding combustion rates in proportion to the subsequently increasing RPM so no further advance is needed. This means that our ignition system has to advance the timing with respect to RPM relatively rapidly at first, but progressively reduce the rate as it approaches 3,500 to 4,000 rpm. This is referred to as the mechanical curve, if a conventional distributor is involved, because the advance is achieved mechanically by means of weights and springs. For an all-electronic system, we refer to this as RPM advance. Manifold vacuum also plays a strong part in dictating the optimal timing. The higher the intake manifold vacuum, the less the cylinder is filled. This in turn means less compression pressure is seen in the cylinders prior to the plug firing. The result is that the flame front progresses slower, thus requiring more advance. 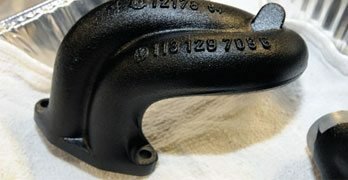 At part-throttle cruise, where the manifold vacuum is high, and the RPM still relatively low (say 2,000 to 3,000 rpm), a typical engine may need as much as 50 degrees of advance to get the best results, and “results” in this instance means mileage. Shown here are the basics of what you might expect of the RPM-related advance curves of three differently spec’d engines. 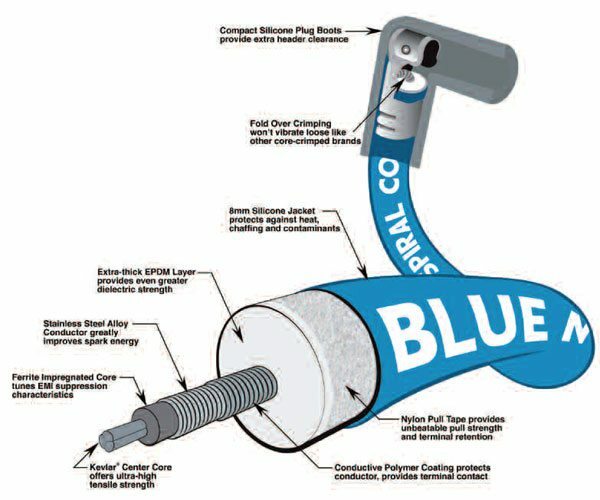 The blue curve is representative of a stock engine with a modest cam and CR. The black curve is for a typical hot street engine; the red curve is for a race engine. When an engine is modified to any real extent, the timing curves of the RPM-related advance and the vacuum advance both need to be addressed. Hot, dense charges burn faster than cool, less-dense ones. A simple rule here is: When cylinder compression pressures go up, the advance required at that particular RPM comes down. 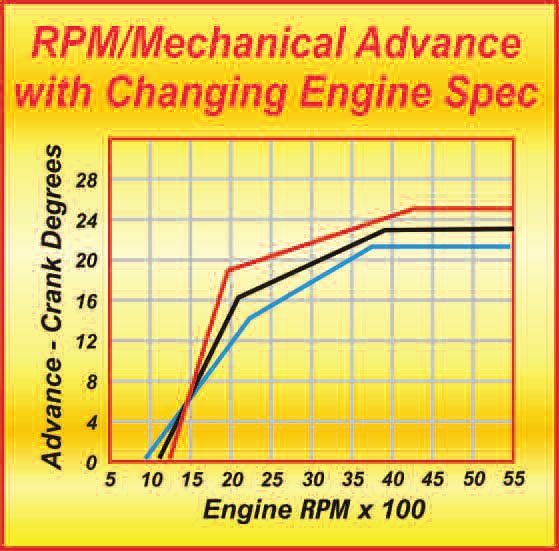 Big cams reduce cylinder cranking and low-RPM pressures, so the RPM-related advance needs to start at a higher level and come on faster as RPM goes up. As the RPM reaches about 4,000 or so (depending on how big the cam is), the ramming effect brings about increased cylinder filling, so advance in excess of what a shorter cam might use decreases until total advance is about the same. If the CR is increased, cylinder pressures go up, so less initial and total advance is called for. In practice, increased cam duration and increased compression tend, to a certain extent, to cancel each other out. As for vacuum advance, this is all too often deleted from modified high-performance street and race engines. Making such a move does nothing to help total power output, but it does serve to increase partthrottle fuel consumption and reduce drivability. When I am modifying an engine, I go to great lengths to retain a functional vacuumadvance system. The return in highway fuel efficiency numbers alone is worth the effort. 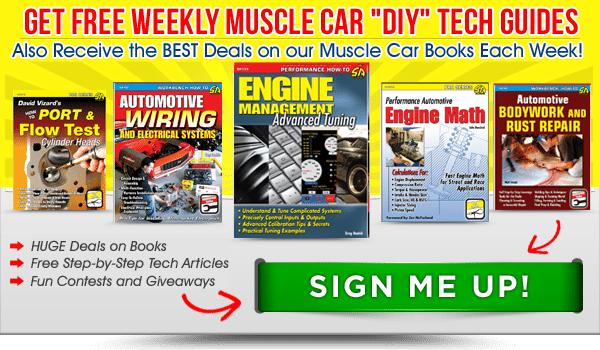 A big-cammed motor at, say, a 2,500 rpm highway cruising speed may need up to 50 degrees of total advance. Given the right advance under these conditions, the fuel mileage can be as much as 30-percent better. Throttle response is also much sharper. In the 1970s and 1980s, there were more performance ignition companies pedaling their wares than spines on a porcupine. Time and product performance have weeded out most of the companies not worth dealing with. Over the years, I have dealt with a lot of ignition companies and the stories I could tell on that subject would fill a book. Suffice it to say that I have simplified my life by dealing with a few companies that have the stuff that works. MSD products are one of the best places to start. I have used MSD ignition systems since about 1972, so I have quite a backlog of experience. 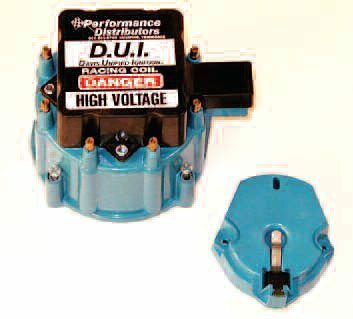 As a point of interest, I must be one of the few, if not the only, driver who has lost a major race due to MSD producing an even better output to the plugs than I expected. But that’s a story for another time. Suffice it to say MSD knows how to light-off cylinders very effectively. Another company I use very regularly is Performance Distributors. 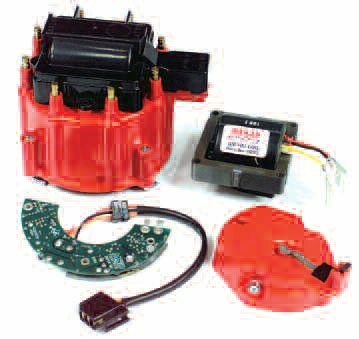 This company makes various highoutput and high-RPM versions of the GM HEI distributor for use in GM and Ford V-8 engines (and a few others). When you buy a distributor from this company, it comes with custom curves (RPM and vacuum) to suit your motor spec. The price is good, the reliability excellent, and the performance great. Best yet, it all comes in a self-contained unit with a one-wire hookup! Another company that has some promising ignition equipment is Ignition Solutions. They have a plasma generating unit, which turns any system’s spark into a multi-fire plasma discharge. The temperature, current, and energy put into the spark is dramatically increased. It even makes a multi-spark system, such as an MSD, fire multiple sparks. No, that’s not a misprint. Each of the MSD’s individual sparks becomes three or four sparks. So if the MSD sparked, say, four times before adding this unit, it now sparks a total of 16 times. I know someone is asking, “Where does the additional energy come from to generate these multiple and upgraded sparks?” So here’s how it happens. 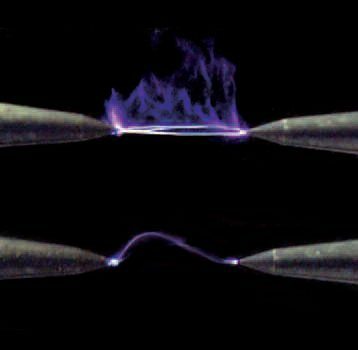 In essence, the plasma booster could not be simpler, but it took the genius of Ulf Arens, a highly qualified university lecturer and ignition consultant, to come up with it. Installing the box, which has no direct connection to the vehicle’s power supply, creates a capacitive/inductive resonant circuit. The box has one ground wire and one wire for each coil positive terminal. 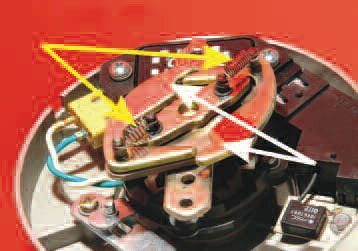 For a single coil, the hookup involves connecting just two wires. In the case of the multi-coil V- 8, there is a simple nine-wire hookup. When the ignition system fires the plug, the capacitive/inductive part of the system resonates. 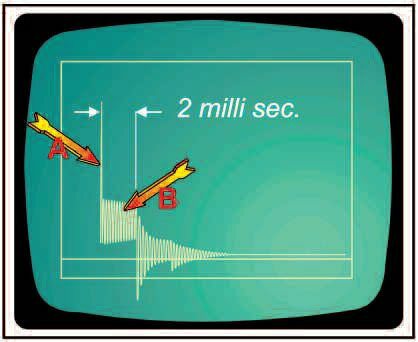 This first fires the plug in the normal direction in a conventional manner but, a fraction of a micro-second later, a spark in the reverse direction also occurs. This swinging of spark polarity delivers four to six highenergy sparks before the available energy drops to a level too low to be of further use. The considerable increase in plug current and energy has to come from somewhere. Fortunately, the source of this increased spark current/energy is easy to appreciate. Take a look at the result of an output of a conventional ignition system in Illustration 8-3. The 1- to 2-microsecond spike indicated by arrow A is the high-temperature (about 3,300 degrees F) part of the spark that actually lights the charge. The section indicated by arrow B is the after-burn phase. It is of relatively low temperature and contributes nothing to the ignition process. The amount of energy in area B of the spark is actually about 85 to 90 percent of the total spark energy and, in a conventional system, just goes to waste. Here is a Performance Distributors HEI-style unit in a race-winning bigblock Chevy built in my Charlotte, North Carolina, shop. Note the clear cap, which makes it easy to check the rotor alignment. After alignment is verified, we usually change to a regular solid-color cap. 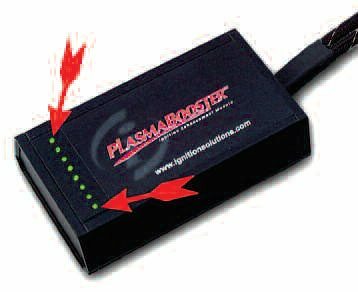 The Ignition Solutions plasmagenerating box has LEDs (arrows) that indicate each cylinder is receiving the plasma output. 8-3. The spike (arrow A) is the coil output into a conventional spark. Section B in a conventional system just goes to waste. When a plasma booster is installed, the otherwise-wasted energy in area B is utilized in the multiple spark the unit delivers. Not only are the sparks multiple, but each spark delivered also has about 80-percent-more current than a typical spark. All this has obvious advantages in terms of power potential, but plug life and ignition reliability also come in for some improvement. Since the plug’s spark polarity switches back and forth, the erosion of the electrodes is almost canceled out, so the plugs last much longer. Also in the very unlikely event of the plasma booster failing (it is about as reliable as a 6-inch-steel rule), the system automatically reverts to the OE ignition without any human (or otherwise) intervention. Any time the density of oxygen is increased, the charge burns faster. As previously noted, peak power is usually produced when the cylinder pressure peaks at about 15 degrees after TDC. If the charge burns faster, then there is a real need to retard the point at which the charge is fired—by pulling out some timing. As a basic rule, if you expect to increase output by more than one-third of the engine’s original output, either by means of nitrous or some sort of supercharging, then expect to back out the timing so the total timing at WOT is about 5 degrees less. 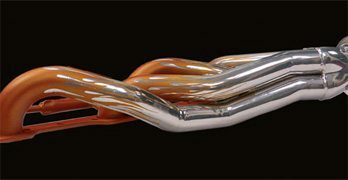 As boost or nitrous is increased, expect this trend to follow suit. 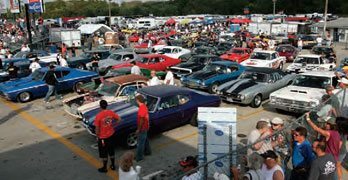 A heavily boosted or nitrous-injected engine may need as little as 20 degrees of total timing. The key ingredients for a super spark are temperature and watts of power. 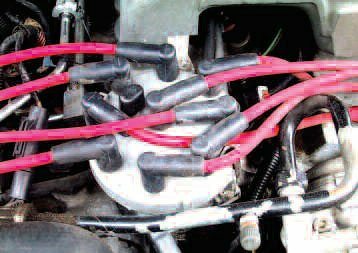 High currents and voltages generate this spark intensity, so that is what is needed when you buy a performance ignition system. But all the effort of accruing the parts for a killer ignition needs to produce two things: a greater output and lower fuel consumption. In terms of spark output on a test rig, I have seen very strong results with an MSD box and a plasma booster tied-in to work together. The question is: How much extra in terms of power and economy did it produce? Well, let’s start with the old adage that you cannot fix something that is not broken. Some engines have a very good burn characteristic that needs only (relatively speaking) a minimal spark to get the job done. Others have chambers that do not have such good characteristics. If you put a maxed-out system on an engine that lights-off easily, the gains will be minimal, even though the ignition system is working exactly as it should. Here is what a plasma booster can do for a spark. The lower example is that generated by a high-output competition ignition system. The upper example is the result of adding a plasma booster to the system that produced the lower spark. A prime example here is the original Mini Cooper engine (A Series). If this engine has a decent spark from an accurately firing but basic electronic-ignition system, we find that adding bolts of lightning does nothing to the output or economy. But engines like this are not the norm. 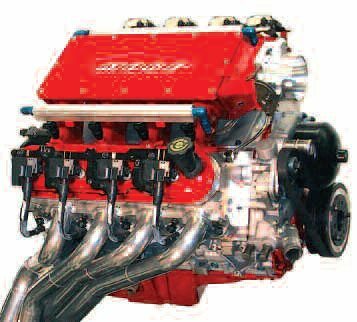 In practice, we find that four-valve, pent-roof engines usually respond to a super spark to the tune of 2 to 3 percent. That said, I did find a 5-percent increase on a four-valve Ford 4.6 Mod Motor—sometimes those bigger gains are there. Engines with big bores (big blocks of almost any make) also usually respond well because a more-aggressive light-off leads to a faster initial flame-front travel, and that’s a good thing. Finally, some combustion chamber shapes do not burn well when a high piston dome (for compression) figures into the equation. Big-block Chevys and Chrysler Hemis fall into this category and usually respond.